Hey guys, how are you doing ? I am still kinda stressed and in need of a vacation more than ever, moreover the weather isn't being helpful...it's very mutable, and I am trying to enjoy each day of warmth and sun at a time, knowing it might change quickly. 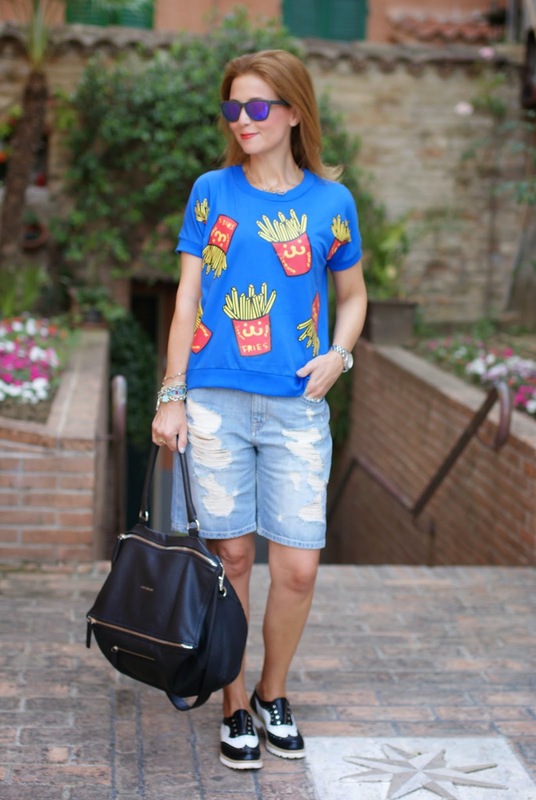 The other day it really felt like true summer, and to have a walk with hubby I decided to opt for a very laid back casual outfit, with ripped shorts and a fries print blue tee I found on Blackfive. The add of a roomy bag and my Lemaré black and white Oxfords helped me to create one of the most comfortable looks of all the time, so the walk was long...and, as ever, it led me to some cool shops for some good shopping ;). 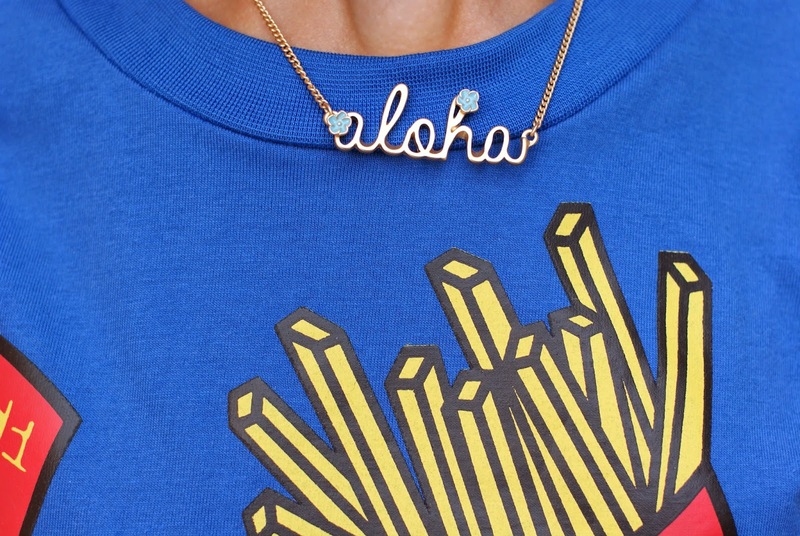 French fry print is really hot this year, also thanks to the latest Moschino collection from designer Jeremy Scott, that made fast food fashion very popular. I have to say I enjoyed the Moschino collection and for one moment I was ready to buy some cool piece from it, but then I stopped for one minute and decided to get myself something with that trendy print for a cheaper price, and save my money for something less "fast fashion". 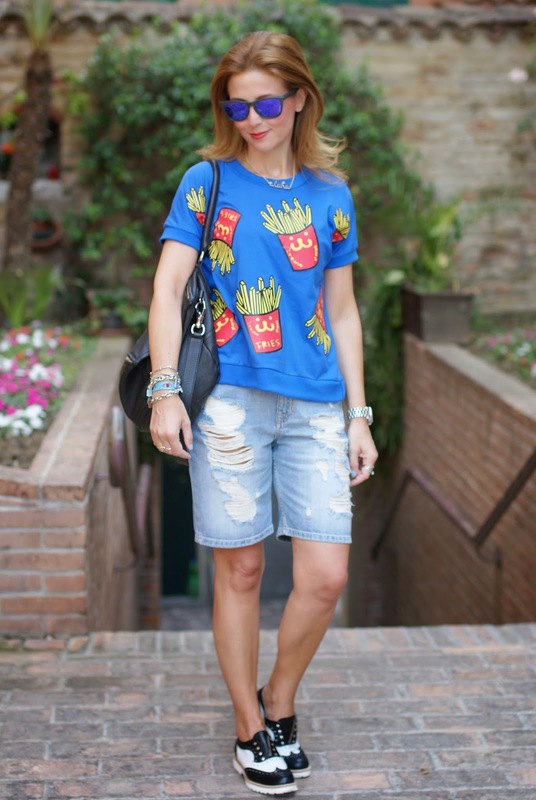 I almost forgot my french fries print hunt until when I saw this cute short sleeved blouse on Blackfive, and was hooked by it. The color is perfect and it also has the perfect relaxed fit. 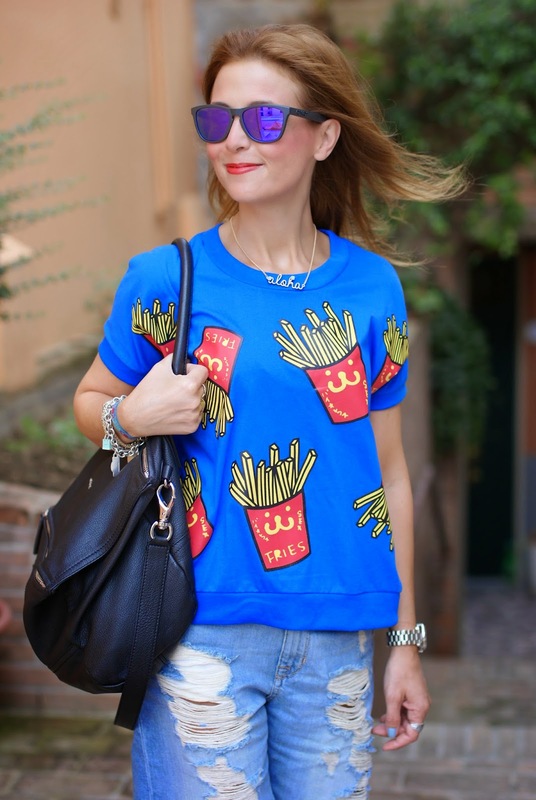 It is not Moschino, but it satisfied my hunger for fries, LOL. 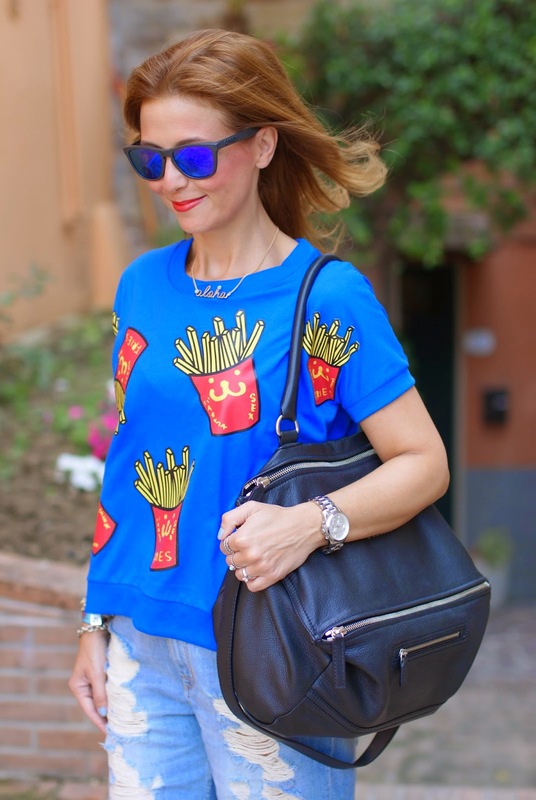 La stampa con patatine fritte è davvero alla moda quest'anno, anche e soprattutto grazie all'ultima collezione Moschino del designer Jeremy Scott, che ha sdoganato la moda "fast food" e che a me è piaciuta al punto da farmi sentire pronta ad effettuare un paio di acquisti di un certo livello. Mi sono, però, fermata un attimo a riflettere e mi sono detta che avrei trovato qualcosa con questa stampa trendy ad un prezzo inferiore, decidendo in seconda battuta di risparmiare il mio denaro per qualcosa di diverso e meno "fast fashion". 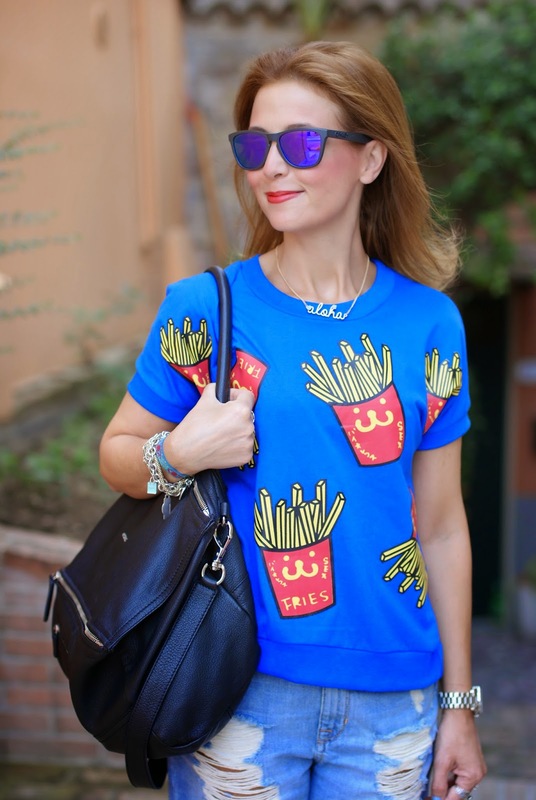 Avevo quasi dimenticato la mia caccia alle patatine "indossabili" fino a quando ho notato questa deliziosa blusa blu su Blackfive, che mi ha colpito per il colore e per il taglio. Non sarà Moschino, ma ha soddisfatto la mia fame di patatine, LOL. My black and white Oxfords are from Lemaré, a premium shoes brand from Marche region, aren't they lovely ?. I also have them in metallic leather, I showed them to you in this previous look. Slip-on Oxfords are pure genius and these ones from Lemaré are among the few shoes I can wear without any sock that don't destroy my feet...their leather is so smooth and soft !. They look great with trousers, with long or mini skirts, and even with shorts, being very versatile and an evergreen kind of shoes. Le mie scarpe Oxfords bianche e nere sono Lemaré, brand che produce scarpe di qualità nelle Marche, non sono adorabili ?. Le possiedo anche in pelle metallizzata, in beige, ve le avevo mostrate in questo look. Le Oxfords slip-on sono un'idea geniale e queste Lemaré sono tra le poche scarpe "chiuse" a poter essere portate da me senza calze senza il rischio di avere i piedi distrutti da bolle e ferite, la pelle in cui sono fatte è morbidissima e liscia !. 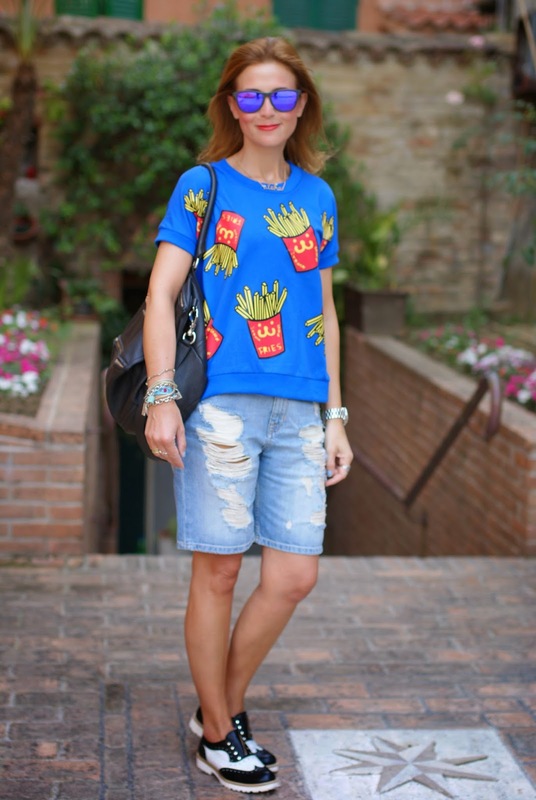 Stando benissimo sia con pantaloni lunghi, gonne maxi o mini ed anche con gli shorts, questo modello classico si rivela anche molto versatile. Everytime I wanna be comfortable with style, my beloved bag Givenchy Pandora helps me out. I adore it, it's been one of my best bag purchases ever, and among my Givenchy bags it's the most original one. I think it looks great in a casual look like this one !. Ogni volta che voglio stare comoda con stile, la mia adorata borsa Pandora Givenchy mi viene in aiuto. La adoro letteralmente, è uno dei miei acquisti migliori, tra le Givenchy che possiedo la più particolare e originale. In questo look casual stava proprio bene !. 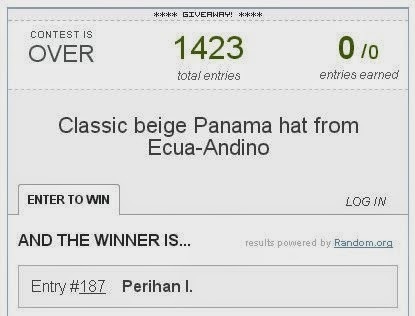 Ecua-Andino Classic Panama hat Giveaway: The winner ! It's time to announce the winner of Ecua-Andino Classic Panama hat Giveaway ! The lucky winner, selected randomly with Rafflecopter, is Perihan Ince from Istanbul ! Congrats dear, I am gonna give your details to Ecua-Andino staff so they can contact you and organize the shipment of your prize. Thanks everyone for taking part in this Giveaway and stay tuned for some more surprises !. Sorry to hear that you're feeling stressed and surely the lack of good weather doesn't help much in order to feel better. I hope that your holidays will come soon enough. Dai resisti, anch io sono satura voglio partire!!! noo! bellissima questa maglia, la voglio! Troppo forte questa maglia, mi piacciono molto gli shorts e le stringate! Mi piace questo look un pò spiritoso! I jeans ti stanno davvero bene.. La tua collana è carinissima!!! Hope we get in touch. Che simpatica questa felpa! 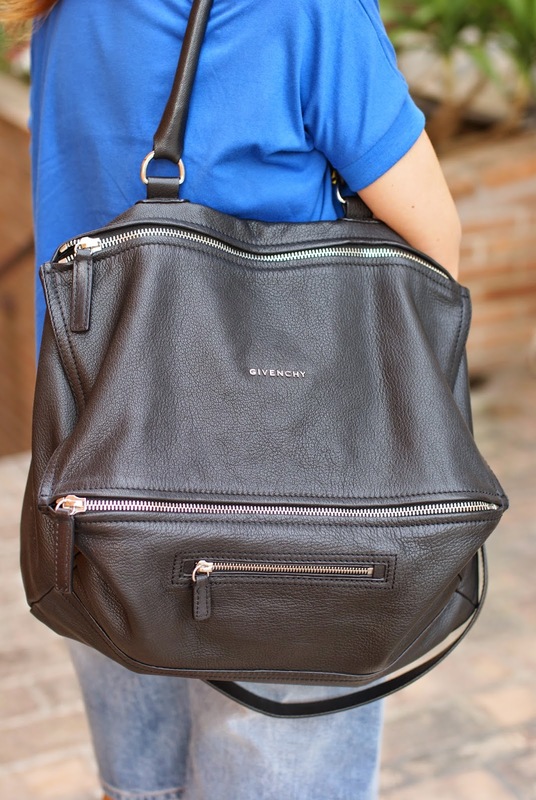 :) Adoro la borsa di Givenchy! Ma che bello questo look più sbarazzino del solito!! 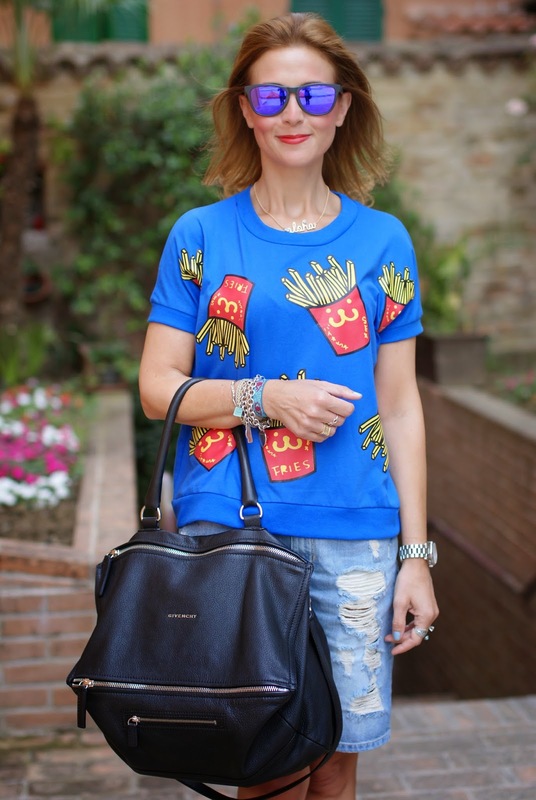 Adoro la maglia e anche le scarpe! Ma che bella in versione Pop con questa tee divertentissima! Brava!! Bellissimo questo look!!!! La maglietta è favolosa e tu stai veramente d'incanto!!! 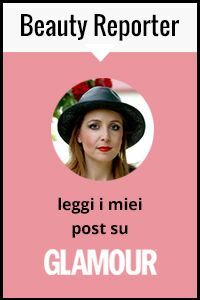 Vieni a trovarmi su www.lameladibiancaneveerarosa. 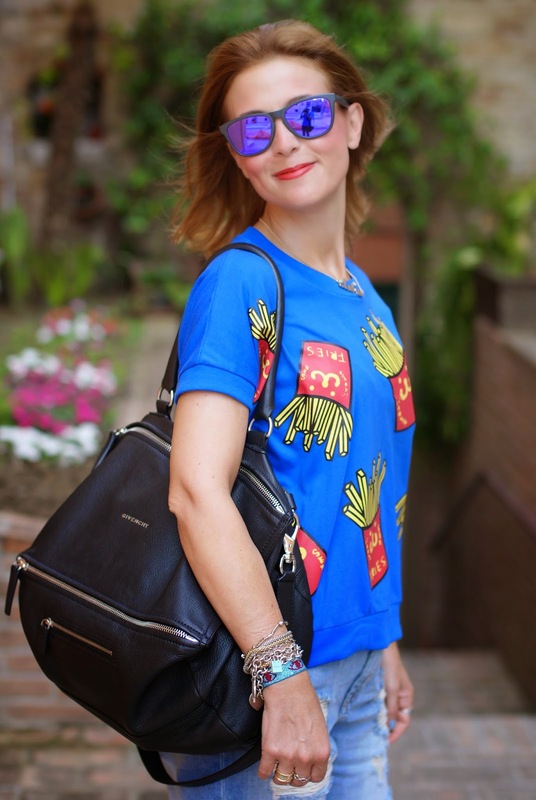 Molto carino questo look, comodo e trendy! I love the trendy print. I think you were right to go for a cheaper option than splurge on something so "right now" if you will. If you think the quirky print fits in your closet, then you can splurge! La felpa ha una stampa davvero carina!! 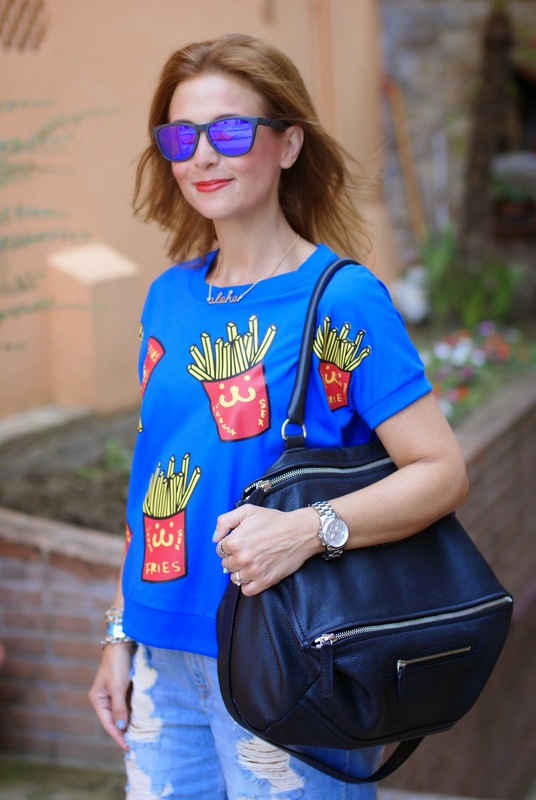 Me encanta la camiseta con las patatas fritas, ¡es una pasada! 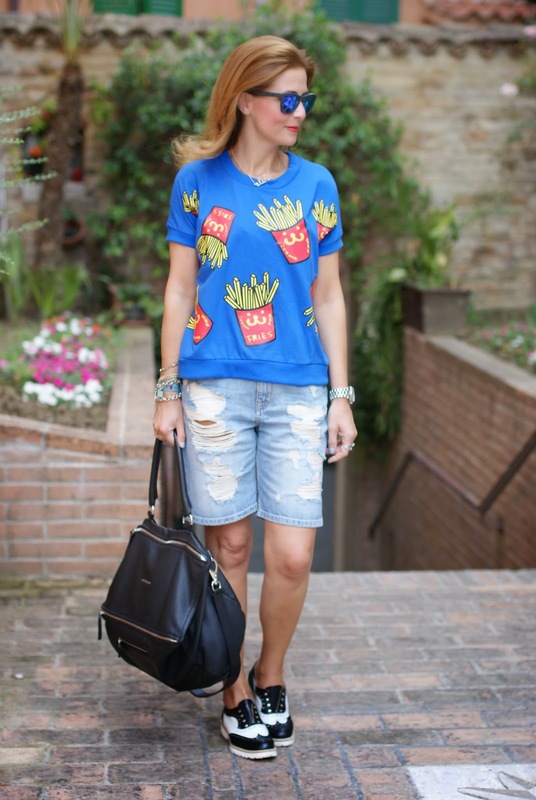 You can't be stressed when you've got French fries on your shirt!! haha, you look adorable-so edgy and fun all at once! Love this-just followed along via GFC!